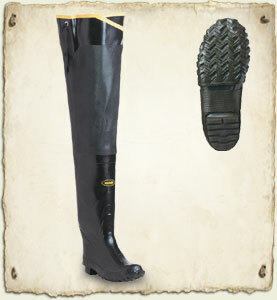 -100% waterproof, ozone resistant, heavy-duty natural handcrafted rubber. Trac-Lite outsole for all-terrain traction. 9mm wool felt midsole, polymeric foam insulation built into bottom, wool felt leg lining. Removable EVA insole for comfort and cushioning. Reinforced leg, skirt and ankle for durability. Fiberglass shank for a lighter weight with maximum arch support.